That copy of St. John Paul II’s The Theology of the Body your twice-divorced aunt cannot live forever without. The Spanx your sister really should be wearing if she insists on leaving the house. The box of nicotine patches that could “add decades” to your aging dad’s life. Suddenly public spaces begin to look creepily like those paintings of Hell by Thomas Kincade. (At least, that’s what those fuzzy daubings of teddy bears and leering children suggest to me.) Everything flickers, shimmers, flashes, even moves. See those mechanical front yard dioramas where Santa endlessly cracks his whip over a team of hyped-up reindeer? In most displays, there isn’t the slightest hint of Mary, or Jesus. Not even in places that sport a menorah. Which at least serves as a reminder that all these glamorous portraits of the sacred Winter season have some faint origin in ancient desert events and a Semitic religion. We really are in for four long weeks of Santaclaustide, as Evelyn Waugh dubbed sacred winter in Love Among the Ruins. Not all of this is a loss, of course. Some of us have a solitary bent and a naturally Augustinian suspicion of mankind. Especially when mankind shuffles forward and presents himself in groups. For us the snowing over of Christ’s-Mass, and the “real presence” of animatronic elves, presents a unique opportunity. What if the Season that everyone else is celebrating were actually Christmas? If they were in fact excited by the advent of a Savior for their sins? (I’m keeping a list.) Then we misanthropes would have to find a way to celebrate it, at risk of blasphemy. It’s wrong to fast on Sundays. Just so, we’d feel religiously obligated to attend some of the parties, to pin on a grin, to pile up gifts for our friends to return, and even to wear together those clashing, unflattering colors, red and green. All these glamorous portraits of the sacred Winter season have some faint origin in ancient desert events and a Semitic religion. Happily, none of this is true. Advent is not a festive season. And it hasn’t even started yet. Still, the noisiest neighbors’ yards are already pullulating with colors, and radio stations are even now pumping out the treacly voices of Johnny Mathis and Paul Anka, reminding us of the deep cosmic meaning that underlies each icicle. So the feast — whatever it is — that everyone’s celebrating isn’t religious at all. We are perfectly free to absent ourselves, or dissent. It’s the moral equivalent of Basque Independence Day. We don’t have to wave the flag. When people say, “Happy Holidays,” respond by saying, “Happy Generic Meaningless Winterfest!” Then explain how the war on Christmas is part of a systematic attack by secularists on all of civil society. How it culminated in the HHS mandate. Nod solemnly as they back away. Disrupt attempts by the relatives you dislike to enforce your presence at all-day, child-crazy festivities of gift-opening, football or reruns of Meet the Parents. Instead drag them to the most traditional, distant liturgy you can hunt up. If there is a Latin Mass in driving distance, make some complaint about the missal used there. Insist on finding an Armenian Catholic or Syro-Malankaran rite to attend. So even the sermon will be in Foreign. Explain to one and all that this is what “real liturgy” is like. If you must attend a festive Midnight Mass with the family, remind everyone you haven’t seen all year of the Church’s regulations concerning Confession before Communion. (If you’re Protestant, just quote St. Paul: “Wherefore whosoever shall eat the bread or drink the cup of the Lord unworthily, shall be guilty of the body and the blood of the Lord.”) Then ostentatiously refuse to receive it yourself, to point up the gravity of sacrilege. Kneel with eyes closed at the end of the pew, so all the pagans in your family have to climb over you. If you must play host to the family, insist on making this Christmas more authentic. No ham, no turkey, no stuffing. Just Middle Eastern foods like roasted goat. No “secularized” Christmas carols, either: just Melkite and Maronite hymns, or (as a concession) a Gregorian chant CD of the Christmas Mass, played over and over again. Pop in a DVD of The Passion of the Christ, reminding the wee ones, “This is the reason for the season.” Then go smoke your cigar on the porch. You’ll have ample privacy soon to meditate on the Four Last Things, or finish reading that novel about the Apocalypse or demon possession. Next year, you’ll be left in peace. This essay originally appeared, in a slightly different form, in the National Catholic Register in 2012. © 2017 EWTN News, Inc. It is reprinted by permission. This made me smile. Then I noticed it’s from a pre-Trump/ pre-Francis world. That’s why it seems so cute! Then I thought about my friends who are (still) guilty of some of these martyrdom/ screwball activities in the name of Doing Christmas Correctly. We are in a different era now. We gotta build a bridge to these traditionalist weirdo (socialist?) friends…who i think are the ppl you’re talking about here. I don’t know how to do this but we have a few weeks. Please update this and give the world the Tradinista Guide to Santaclaustime. 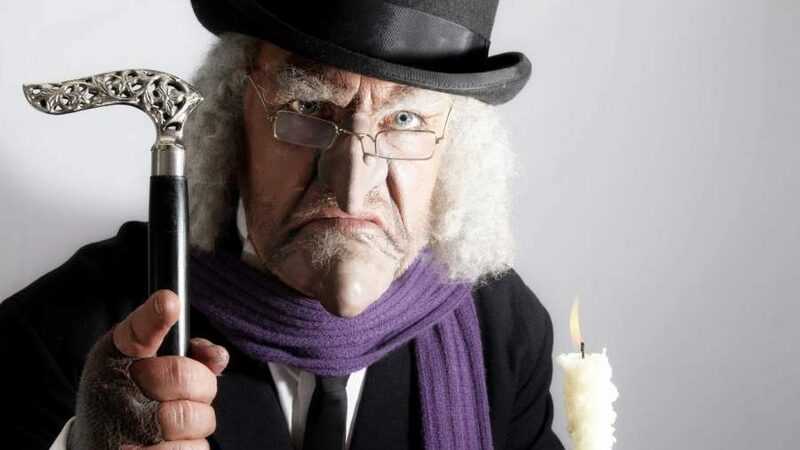 Well, if you just ain’t the Scrooge who stole Christmas ! This piece is clearly some kind of plant as shown by the effort to shut Christmas down on February 2 since everyone knows that true Christians always switch to the Julian calendar that day in order to extend the season another couple weeks or so. Clever, but some more disclaimers posted around all those “recommendations” that they are not in earnest might help skimmers and those literal among us who will bump their heads on the rafters after just the first one. It’s only where the author is known as a jolly good fellow that a second look will put things in context. Little flashing signs — “Scrooge thoughts, not author’s” or some such. How does a complete stranger describe me so well? Actually..not quite me. I went to a Syro-Malabar church, not Syro-Malankar. Equally incomprehensible though, I suppose.